Gamma Knife and CyberKnife are similar in that they are both clinically proven systems for delivering high dose radiation to tumors with sub-millimeter precision. However, that’s where the similarities end. CyberKnife has evolved from the conventional technology of the Gamma Knife to improve patient comfort during and after treatment and expand the parts of the body that can be treated. 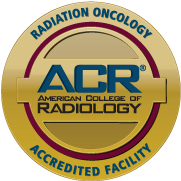 CyberKnife can perform dedicated stereotactic radiosurgery (SRS), just as Gamma Knife does, but it is also capable of delivering stereotactic body radiation therapy (SBRT), also called stereotactic ablative radiotherapy (SABR), which enables it to perform treatments throughout the body – not just the brain and cervical spine. SRS is used by both systems to treat brain tumors, vascular lesions and functional disorders such as acoustic neuroma, trigeminal neuralgia, and arteriovenous malformations (AVM). SRS is typically used as a primary treatment of operable, inoperable, or recurrent brain tumors. But it also can be used in combination with surgery, chemotherapy, and other treatments. Despite the fact that Gamma Knife and CyberKnife can both deliver SRS, there are key differences. First used in U.S. in 2001. First used in U.S. in 1979. Another difference between the two systems is the method of radiation delivery. 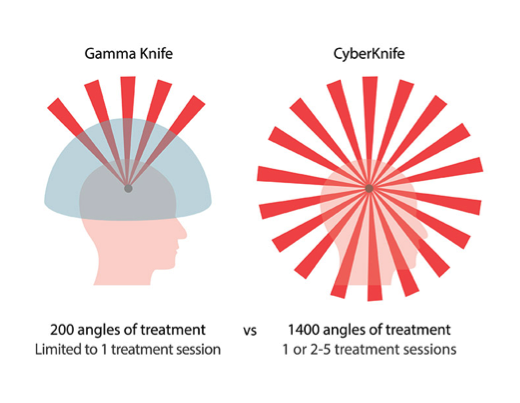 Gamma Knife is limited in the number of angles it can approach the tumor, while CyberKnife can deliver radiation from thousands of angles, limiting the impact of radiation on healthy tissue or organs surrounding the tumor. While both Gamma Knife and CyberKnife can treat cancerous and non-cancerous tumors with extreme precision, CyberKnife offers unique advantages, particularly its ability to treat tumors throughout the entire body. With advanced robotics, intelligent tumor tracking, and real-time imaging capabilities, CyberKnife can treat tumors in the body that move as a result of breathing with the same precision as treatments to the brain, without requiring uncomfortable motion-restricting devices. CyberKnife’s revolutionary advancements enable treatment of tumors in the brain, head and neck, spine, lung, prostate, liver, pancreas, kidney and more. CyberKnife’s precision and freedom from invasive head and body frames have opened the realm of treatments to recurrent tumors that were once thought untreatable after previous radiation or surgery.